Simple and elegant are the two best words for a place such as the Rivington Grill. It's a solid neighborhood restaurant which screams the comfort of home. The decor, although simple, really creates a funky ambiance I have yet to find in any other place in Dubai. Quintessentially British, this restaurant has become my favorite comfort food spot in town! Everything on the menu has been a hit so far, but here are some of my favorites: parsnip soup, fish and chips, and the Bannoffie pot. This time around, I opted for quick comfort. The parsnip soup pictured below was exactly the "comfort" I was looking for. It was creamy, but not heavy, flavorful, but not overwhelming, and with the nut crumble, even offered some crunch! The Rivington Grill has a couple of staple dishes, and the fish and chips is one of them. The generous serving of crispy cod fillet coated in the crunchy golden batter was everything one could ever want out of this traditional dish. This is the epitome of deep fried deliciousness!!! Last but not least....This was the dessert I had actually tasted for the first time the week before, and was the driving force for my return the following week. A Bannoffee Pot filled with layers of cookie crumbles, toffee, whipped cream, chocolate ganache, and topped with gorgeous caramelized slices of banana. Just note the smooth and creamy texture of the chocolate nestled under the banana, YUM YUM YUM! This dessert is SUBLIME and worth breaking the diet for! The Rivington Grill is on now my regular rotation of restaurants, not only because it's in my neighborhood, but it's quality food for a reasonable price. 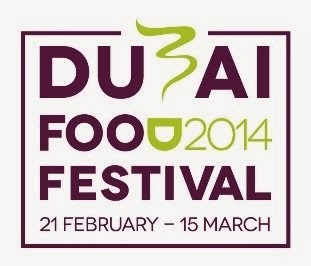 They are in the process of opening a second branch in the Madinat Jumeirah soon. This is great news and a great way to spread their love of solid British cuisine to the other side of town. Looking forward to many more wonderful meals at this comfy neighborhood restaurant that always welcomes me warmly. Cooking classes seem to be the latest trend in Dubai, but everyone has been putting their own spin on things and focusing on what they do best. BiCE Mare is a crisp Italian restaurant concept focused on seafood the Italian way! On this occasion Chef Francesco Guarracino taught us the ins and outs of making the perfect pasta dough, and then various styles of preparation such as fettuccine, minced beef ravioli, and tortellini, stuffed with lobster......YUMMMMY! 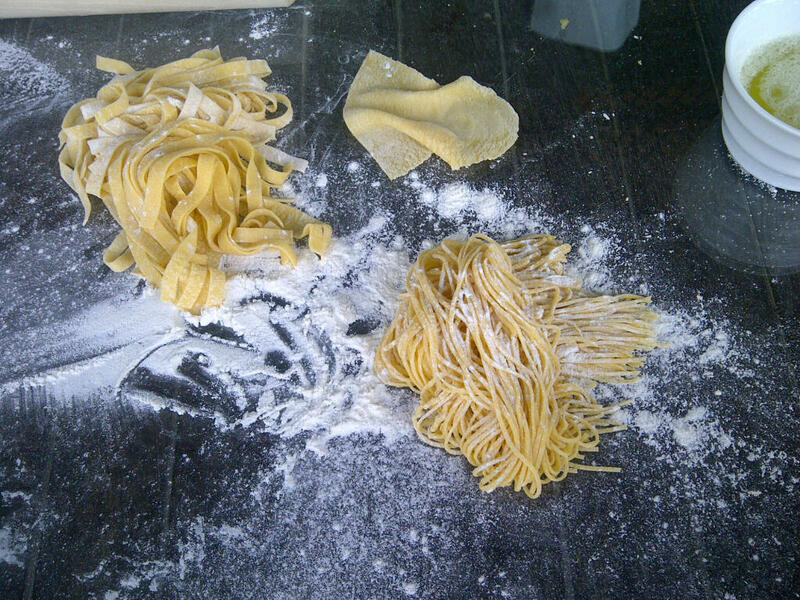 Pictured below are the simple tools you need to prepare the pasta. At this point it's pretty straight forward eggs and flour which is mixed and kneaded by hand before it's rolled through the pasta machine on the bottom left corner of the photo. The key to good pasta is getting the right consistency and that can only be achieved through patience, practice, and this handy dandy pasta making device. Chef showed us how to make the long pasta pictured below on the left as well as the stuffed pasta shown on the right. It's actually pretty basic, but it's a time consuming process you have to be dedicated to and plan ahead for if you are to enjoy the delicate chewy texture of the freshly made pasta at home. First we enjoyed the rustic house-made bread, crackers, and grissini served with three dipping sauces: pesto, sun-dried tomato, and olive tepanade. The crusty bread was the perfect vehicle for the sauces, the tepanade was my favorite. It made it difficult not to eat the whole loaf, but i disciplined myself enough to hold off, knowing there was a full on meal ahead. We were then served the first course, two plates of "tasting style" starters consisting of fried calamari, seafood and avocado salad, grilled octopus, and seafood ceviche (pictured on the left) the other plate was filled with traditional Italian goodies such as a roasted eggplant cup stuffed with mozzarella, house cured bresola with truffle oil, Caprese, rocket and parmesan salad, and baked goats cheese crostini with walnuts and pesto. The main course on this over indulgent day of all things ITALIAN was a trio of pasta. We had the beef ravioli in a rich mushroom cream sauce, the lobster tortellini in a sweet tomato sauce as well as a monkfish cannelloni in a spicy tomato ragout. Since pasta was on the brain, it was easy to gobble up all these little treats so preciously prepared by the BiCe Mare kitchen. We decided to keep the carb overload going, by diving head first into a tray of decadent sweets! The cannoli was my focus, because it's so rare to find it around these parts. This Italian dessert of Sicilian origin is common in the States, but otherwise rarely found outside of it's native country. The filling is usually a sweet ricotta garnished with nuts or chocolates, and is a gorgeous balance of crunchy, sweet, and creamy goodness. One can never have enough! This cannoli however, was not like the traditional ones I've enjoyed in the past. It had a custard like filling, so you can imagine my disappointment. Nonetheless, I quickly moved onto the Tiramisu in a cup which had a strong coffee essence with a touch of cocoa. No wonder they call this the "pick me up" dessert, it can really put a smile on your face after just one bite! Chef Jean-Francious Piege is the Chef at one of the hottest new restaurants in Paris, Thoumieux. He was trained under the well known Chef Alain Ducasse, essence of the celebrity haute chef. Chef Alain is no stranger to the Michelin star galaxy and introduced his colleague, Chef Jean-Francious to the gastronomical heights he is so used to. Chef Jean-Francious quickly gained his own Michelin star status at this new Parisian Hot Spot and is now introducing a taste of his unique cuisine, a combination of molecular gastronomy and beauty, to the Gourmet Abu Dhabi scene. Time for the culinary adventure to begin! We opted for the five course tasting menu, I felt it was the best way to understand the skill of the chef through the variety and technique used in his cuisine. Our first item was the "Duck Foie gras from "Lande" region served with a citrus jelly"(Left). It was nicely seasoned, but could have used a touch more of the citrus jelly. Nothing makes me happier than that balance of savory and sweet matched with the velvety texture of this gourmet pate. This was then followed by "The perfect egg emulsion of spinach gratin, black truffle" (Right). The spinach gratin was almost souffle like, and technically cooked very well with a light touch of cheese. The Truffle topping was elegant and simple, and enhanced the presentation as well as the flavor of this dish. The egg which was on the bottom of the martini glass, was a bit runny for my liking, but it was a combination of flavors and textures I had never experienced before That's two down, three more to go! Next we enjoyed this Ravioli of Blue Lobster, Ginger Bouillon and Coconut (Left). It was a delightfully delicate combination of all my favorite ingredients in one dish. The coconut and ginger broth was sprinkled with fresh robust coriander and radish. The peppery sharpness of the radish also added a bit of texture to the other soft flavors. This dish got high marks in my formal review of the chef. Course number four was a "Fillet of John Dory with gingered carrot, ciboulail*, and caramelized pearl onion" This was another beautifully prepared and presented dish. The crispy and sweet gingered carrot provided the right amount of crunch beside the caramelized pearl onion. The Fillet of John Dory was slightly overcooked, but still tasted great with the flavorful accompaniments and aroma of the unusual combination of ingredients. At this point it was difficult to believe there would be another course.....but there was...plus dessert! Below is a "Slowly cooked milk fed veal rump, tuna condiment, lemon and parmesan". The veal rump was cooked to a medium temperature and presented in medallion form. It was tender and juicy and worked well the potato puree topped with blue potato chips. The tuna condiment however was less exciting for the palette. It was an interesting blend of ingredients, which in theory should balance, but it just didn't deliver. The parmesan and lemon could have worked well, but the cheese was too sharp. It needed to be balanced with something less fishy and more neutral. I'm back to Deira on my mission to discover the next culinary hidden gem. I have been exploring the Asiana hotel a lot lately mainly because it offers so much in one convenient location. However, it also has this unique authentic feel to it, as if you've left Dubai and set foot into a little Asian haven. I've already checked the Korean off my restaurant "to-do" list, next up is the Japanese joint, Hanabi. We were seated at our cozy little table towards the back wall of the restaurant. There wasn't much foot traffic in there, so we were able to select a table to our liking, On the charger plate was this beautiful Origami crane, a unique touch and warm welcome. The crane is symbolic in Japanese culture as a sign of hope and peace. We were then served cold Mugicha Tea, which is traditionally made by briefly simmering roasted barley grains. It has a toasty taste, with slight bitter undertones. Many people in Japan believe that Mugicha helps to cleanse the body. There have been studies done that may indicate that it helps to reduce stress. After we placed our dinner order, we were brought this Amuse Bouche. A light salad consisting of mushrooms, spinach, seaweed, and pickled carrots. So far the experience has been pleasant, and it felt more and more like this Japanese was not catering to a western audience like Zuma or Okku. In fact there clientele was indigenous to the Japanese region, and therefor were catering to a more traditional palette. One of our starters was a fresh seafood salad. It consisted of a prawns, octopus, seaweed, sea cucumbers, and a touch of sesame. Next we received our sashimi selection of Blue Fin Tuna, Yellow Fin Tuna, Salmon. All were delicately sliced and plated, and the freshness of these 3 items could be seen by the quality of presentation and the rate of how it melted in your mouth. The colors and marbling also say it all. We also had to try some of the hot items on the menu. I'm a sucker for anything made with Miso, and of course there was plenty to choose from. We ordered the Miso Butter Scallops and the Miso Sea Bass. Both were served with these chewy yellow soybeans, an unusual texture, and first for me. The best of these two was the scallop dish. The balance of flavors was perfect, rich and creamy, but not too heavy. The vegetables were al dente and scallops were cooked to a tendery perfection. The Miso Sea Bass, albeit presented beautifully, and cooked well, didn't really have that powerful punch I have grown to love. It was a delicate and traditional method of preparation, but it needs a little more work on flavor development. Desert was a must when I heard they had Mochi on the menu. They only had one flavor available for the Mochi, which wasVanilla. However they did offer Green Tea and Red Bean Ice Cream. The Mochi, a doughy rice cake filled with vanilla ice cream was sweet and smooth.The rest of the icy treats were also tasty, but not as smooth. The flavor of the green tea ice cream was subtle, and the red bean was more robust. Hanabi was overall a good experience. The waitstaff is almost subservient, but happy to answer questions and accommodate. The restaurant also has 4 smaller private rooms where you can host a lovely dinner for up to 10 ppl. Asiana Hotel is located in the heart of Deira and is a lovely little escape from the Dubai "norm". With authentic Kimonos and decor, its difficult to resist this unique experience. I do have to acknowledge how cute the launch party was. The Soul Communications (previously known as Cherry on Top) PR girls did a great job of highlighting the tools that make this store an internationally recognized brand for kitchen supplies. The set-up below featured cupcake makers, egg poachers, toasting tools, and kitchen utensils. It was a whimsical display of colors and crafts, enticing for anyone interested in tasting and trying to learn how to use these appliances. They even sell a disposable, but sweetly decorated cupcake stand, great for multiple uses, and easy to pack away. In addition, they also carry a cupcake tree for more of a permanent display item, aesthetically pretty and perfect for special occasions and celebrations! I wish I had known about this store before. I often times was in need of random kitchen items and accessories, that were no where to be found. In fact around Thanksgiving time, I couldn't find a turkey baster anywhere in Dubai, low and behold, Lakeland carries them! Unfortunately it was a week too late, but now I know for future reference. I also had a friend looking for roasting bags. They are a great way to prepare a quick meal, without any of the mess or cleanup. Lakeland also carries them in a full selection of sizes, for a variety of proteins from fish to poultry. Last but not least, I brought a friend into the shop just yesterday, and she picked up the perfect little salad spinner. That's a great item to have around the house, especially if you are trying to incorporate more veggies into your diet. It keeps your greens clean, crisp, and fresh and will actually make the process of preparing salads at home a lot more enjoyable. When Chef Russell Impiazzi, the Gourmet Culinary Director at Galeries Lafayette, contacted me about a private cooking lesson, I just couldn't say NO! Those who know me well understand I pride myself on my cooking skills, but it doesn't hurt to get some one-on-one training from the culinary experts in the city. Using the Galeries Lafayette Gourmet market as the backdrop for this gastronomical feat, I was really setting myself up for an evening of excitement! Chef Russell asked me what my favorite ingredient to cook with is, and normally I would say Lobster, Truffle, or Fillet Mignon. But lately I've been feeling kind of Spicy, so I thought I would throw Russell a curve ball and have him create something with Chipotle peppers! And that he did! First up was a Tea Smoked Seared Scallop with a Chipotle Lime Mayonnaise dressing and Avocado Salsa. There is a lot going on with this dish, but this is a true test of the culinary skills of the chef put into play, along with his ability to teach me a thing or two about technique and kitchen decorum. Below is a Wok, lined with sugar, rice, jasmine tea, and vanilla bean pods (not shown in picture). Next, this is covered and brought to a high temperature to create the smoke Vacuum, which the scallops will lightly smoke in. The image to the right demonstrates the delicate process by which the scallops are placed into the smoker. It's a very rustic approach, but one you could do at home. Next Chef Russell showed me how to make his Chipotle Lime Mayonnaise dressing. Now, I am a firm believer in doing things from scratch, but Chef Russell took it to another level by making me hand mix the mayo! I have made my own mayo many time but with the aid of a blender/food processor. If you don't whisk the eggs and oil enough, the texture turns out too runny, so make sure you either have a strong whipping arm or invest in a good kitchen gadget! After the "make your own mayo" lesson, chef Russell insisted I learn how to "Quenelle", a technique I have tried many times, but never quite figured out how to do. But under the watchful eye of Chef Russell, I was able to make perfectly shaped Quenelle for the plating of our scallops. Next up was the USDA Prime Rib Eye with Roasted Garlic Chipotle Butter and a Black Bean Puree with Warm Tomato Salsa, Hungry yet!? The Roasted Garlic Chipotle Butter was up first, All we did here was take a large portion of soft French butter (Isigny Ste.Mere) place it into a mortar and pestle and mixed it thoroughly with the roasted rarlic, diced chipotle peppers, sea salt, and parsely. Once mixed through, it was spread out onto wax paper, and formed into a cylinder, then refrigerated to be used later. The Chef Russell showed me The "Jasper", the king of all ovens, but only for commercial use. The Jasper can get as hot as 500 C Degrees! He also showed me the gorgeous selection of meats available at The Galeries Lafayette, but said his favorite source of beef is USDA Prime Beef. Proud to know that the Americans are a good meat resource! Seriously look at the marbling and color on that steak....it's perfection on a plate! While our steak cooks we went shopping in the market for some fresh produce and ingredients for the salsa. We whipped it up quickly and set it aside until we were ready to plate. It just required a quick touch of heat, so there was no need to keep it on the stove top for too long. It was a nice balance of tomato, garlic, onion, cilantro, and lime juice of course. Now it was time for a challenge...the ever so popular "chef smear"! Now this is one thing I have tried and tried and tried, I just simply can't get the hang of it. Now Chef Russell tried his best to teach me his technique.....which of the two below do you think is mine? The final dish, plated and ready to eat! It was an eventful evening and very informative. Private cooking lessons are great treat, and something you could engage in with a friend or partner for an alternative evening out. It's also a great idea if you are looking to prepare a special holiday treat for a loved one (perhaps for V-day coming right up), then you can pick up your gourmet delicacies right here at the Galeries Lafayette Gourmet department or even sign-up for one of these private cooking classes. It's a good time all around, and you even get to enjoy a delicious feast when you're through!